The clarinet has been used in classical music since the 18th century. Vivaldi, Brahms, Stravinsky and Copland are just a few of the composers who have featured clarinet in their works. As the jazz age dawned, the clarinet's versatility and emotional range made it a valuable resource. Sidney Bechet, Benny Goodman and Artie Shaw are a few of most notable clarinet players in the world of jazz. When writing for clarinet, never underestimate the expressive abilities of this versatile instrument. Just think of the soaring opening notes of Gershwin's "Rhapsody in Blue," the burning solo in Benny Goodman Big Band's "Sing, Sing, Sing" or the elegance of Mozart's "Clarinet Concerto in A." From classical music to swing to Dixieland, the clarinet works well with just about any musical style. Decide which clarinet you want to use. There are 10 instruments in the clarinet family, but the most commonly used are the Bb and A clarinets. (The Bb is the most common.) You'll find the Bb in concert or marching bands, and Bb or A in orchestras or wind ensembles. Each instrument has the same general range (that's sounded range, as opposed to written): from D3 to G6. Consider the mood of your piece while you decide which clarinet you want to use. Each instrument has its own unique tone. Bb clarinets tend to be better for pieces in flat keys, and A clarinets for pieces in sharp keys. The A clarinet has a somewhat darker sound to it than the Bb. Of course, the performer will have ultimate control over interpreting the mood of your piece. Transpose your clarinet parts. 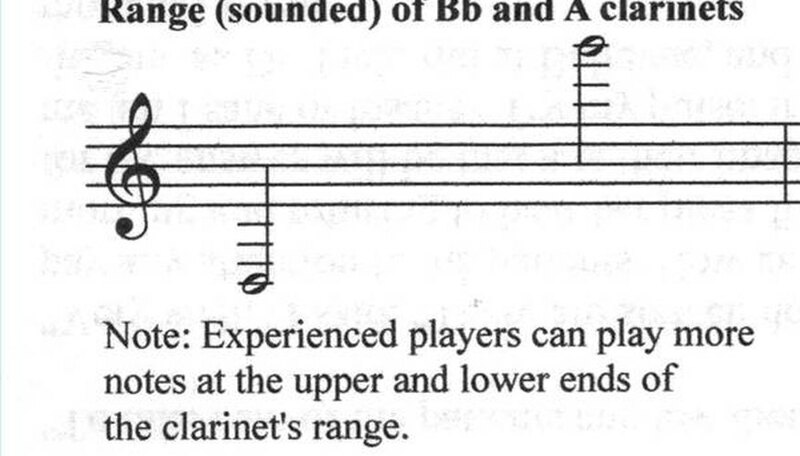 Bb clarinets sound a major second lower than written, and the A clarinet sounds a minor third lower. Notation software like Finale or Sibelius can transpose the music for you. Explore the emotional possibilities of the clarinet. It has a greater dynamic range than any other wind instrument, and is especially good at long, legato passages. When thinking about the dynamics of your piece, remember that the lowest and highest registers are the loudest. Review your piece for playability. Try holding your breath while counting out a phrase to make sure you're giving the musician enough time to breathe. And do not assume that the clarinet player can use circular breathing techniques. Express yourself. Double-tongue, triple-tongue and flutter-tongue passages are all within the capabilities of today's clarinet players. You can also play quarter-tones. Use non-traditional techniques. Some are very easy, like clicking the instrument's keys or humming through it. Provide a key at the beginning of your piece so your players will understand any non-traditional notation. Less experienced players may have problems with large melodic leaps, and with reaching the highest and lowest notes in the clarinet's range. The B-Bb break is no longer considered a technical problem, as it once was. Elizabeth Walsh is a print and broadcast journalist who has worked for ABC and Sirius XM Radio. She holds a master's degree in music composition. Currently a writer for Examiner.com, Walsh specializes in music, health, and transportation issues.